In the medieval period (tenth-eleventh centuries), Göreme formed a district of the province of Avanos. Machan (Göreme) had come into being as a satellite of Avanos, and as Avanos expanded Machan also continued to grow. St. Basil was opposed to the wholly random and scattered pattern of settlement and urged for a more compact arrangement.Cappadocia was taking the lead in the popularity of the Christian centers subject to the Pontus king dom.The monk Simeon founded a Christian colony at Zelvede, which evolved into a prominent monastery hierarchy. At present, our knowledge concerning the social and religious life at Cappadocia is limited. What we know so far is that in the early phase Christian communities began to take refuge in secluded valleys, so as not to prompt the angry opposition of the polytheistic Roman believers. At Avanos, they settled at such places, as Kisistra, Mavrucan on the hill of Çavuşin and in Soğanlı valley and the peaks of Archelhais, Hasan Dağı and Belisirma or in early Roman cemeteries.They began to hew out churches from rock formations next to the ceme- teries. Some monasteries are very ancient. For instance, the Özkonak Belha monastery at Avanos dates to the sixth century, and the Üzümlü church at Zelve is even earlier. The Basil the Great (330-79) discovered for himself a peaceful, secluded and a quite fertile and well-watered site. Here were conducted both the religious practices of prayer, reading and retreat and also handicrafts, trades and even agricultural cultivation. It is related that the first agricultural plots in the region were cultivated by religious functionaries. The monks both supplied their own foodstuffs and fed the poor and wretched wayfarers who took shelter with them. In the Middle Ages, this kind of monastic structure assumed the appearance of a place of retreat, where people who built churches and who supported and commissioned them would retire when they became old. Not surprisingly, the demand to meet the needs of these institutions led the monks to venture into commercial enterprise.The monks would regularly set out on long journeys and voyages to sell merchandise and then return. The monasteries of Basil were not centralized under one head, because each community offered submission to its own leader and easily agreed to the addition of new Christian communities by their side. In any case, the communities were not com- pelled by ritual to worship together at the same time.Naturally, at the time Christian beliefs were being promulgated, it was common for fragmentation to take place. Those who hallowed St. Stylite reserved sacred spaces on rocky peaks; small village communities also spread to smaller and more modest areas parallel with the breaking up of land plots.The clergy raised grains, vegetables, fruit and tended vineyards; they also raised flocks of sheep and herded cattle; some became weavers, others blacksmiths. These colonies were generally situated on the outskirts of a town or in hidden isolated valleys in their environs. These two communities (Stylites and poor villagers) got on well together and made their cemeteries-and even their churches-side by side.This social intermingling also brought disease and epidemics due to poverty and hunger. The bitter circumstances of life urged the people to take refuge in belief, and the people began to crowd the churches of Cappadocia. They also opened wide the gates to the conquests of the Seljuks. This laid the foundation for the downfall of the Byzantines in one blow. Reaction against these circumstances by those who remained tied to the essence of primitive Christianity led to the emergence of monastery life. In North Africa, where the understanding of primitive Christianity is still strong, one portion of the Christians deçided in the second half of the third century to withdraw from the world and gave themselves over to religious , contemplation and ordeal in secluded corners. After the first monastery was founded on an island in the Upper Nile, this movement rapidly spread to Palestine, Syria, Armenia and Cappadocia to achieve this goal and to return to the new primitive Christianity. No sound evidence is available to enlighten us on how the Christians in the area lived. It is possible to reach the following conclusions on the basis of the writings of St.Basil, the founder of monastery life here and his associate Gregory (Naziance) and St. Basil's brother Gregory, the bishop of Nissa , which reflect their views and from the general intellectual currents within Christianity in those years: Lack of recognition of private property; the necessity of labor; the requirement of eating meals in common; the obligation to undergo ordeals by abstinence and the rejection of marriage. The person who achieved the realization of monastic life that evolved in this manner in Cappadocia and who was acknowledged as the Head Saint of the Christians of Cappadocia was Basil (300-79), born in Kayseri.He founded a way of life in Cappadocia similar to that led in the monasteries he visited in Egypt and Syria, which was based on the principle of commonality. The hidden valleys constituted a refuge for the early Christians who fled from oppression and death. 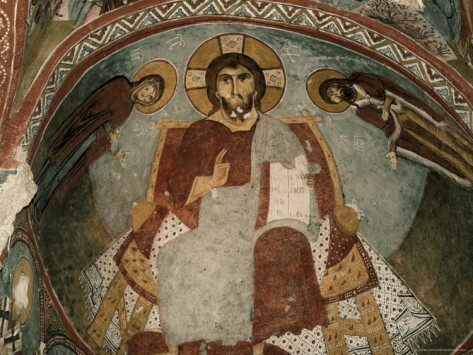 When the emperor Constantine granted religious freedom to Christians, Cappadocia had to a great degree become Christianized. The tufa rocks that were used as a shelter throughout history by those who fled hostile enemies or who withdrew from the world were ideal as places to hide and leave the world behind. Because the volcanic ter rain in the region was to a great extent unsuitable for agricultural cultivation, it was not sought out as a place of habitation; therefore, its being distant from major settlements and its favorable conditions for seclusion attracted settlement by Christians. It permitted them to remove themselves from the evils of the world and devote their lives to worship. For the early Christians who lived in groups based on the principle of communal life, poverty was a source of pride and wealth cause for shame. But, the increase in the numbers of Christians and the growth in the communities led to division in the views, and after the third century, we observe that Christianity was turning away from this early philosophy and way of life.It was no longer centered on communal life and brotherhood. Some sources reveal that monks remained constant to the concepts of commonality and broth- erhood and that they suffered great renunciation for the sake of these goals; but, in time, as the monks became more worldly, the religious functionaries gradually assumed special powers and privileges and formed a sacred caste. The Church itself undertook broad efforts to organize economically and politically, so Christianity conformed to the economic and political institutions of the Roman empire. This led to the ioss of the power and meaning of the early years of Christianity.We are unable to determine precisely hen the ecclesiastical organization began to undergo transformation and bow long these early concepts were viable. 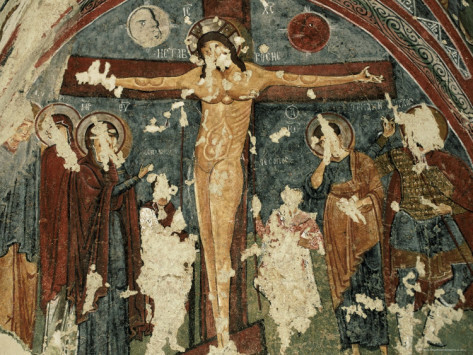 Whether or not the representational arts were permissible was a subject that was long disputed by the Byzantines. The Greek practice of representing the person of a god was a concept that was in constant conflict with the the abstract representation of gods representation in the East; and the people initiated a search for a concrete representation of the phenomenon of god. Emperor Leo III prohibited the worship of images in 725. 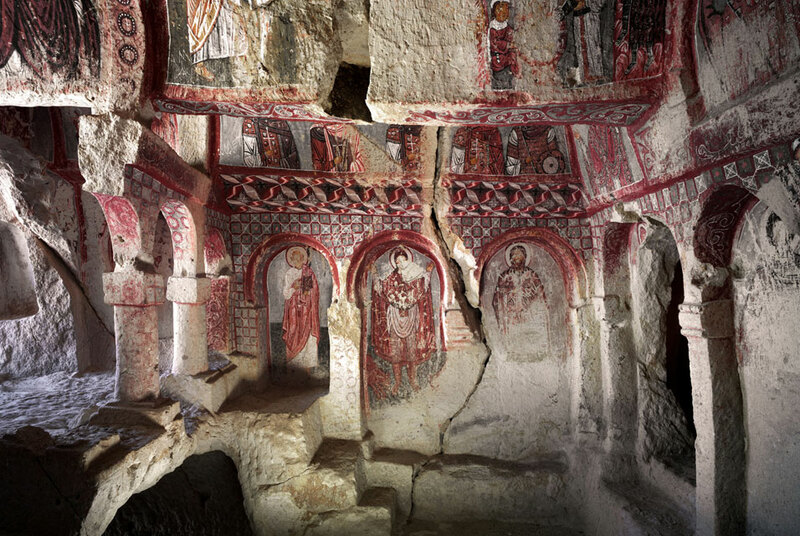 Numerous icons were destroyed by iconoclasts (ikonodul) at this time.Rocky Cappadocia became a place of refuge for Christians fleeing from the cruelties of the iconoclasts in this era. 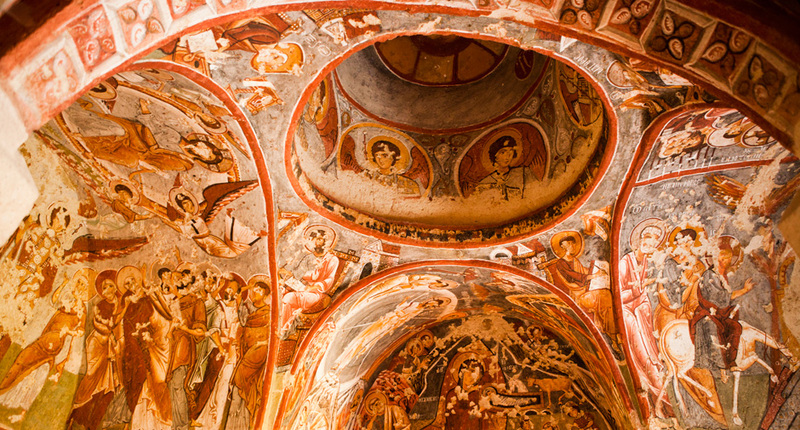 Though not many churches at Cappadocia from the oclastic period exist at Cappadocia, the most typical characteristics of the period are in evidence in the Church of St. Basil at Sinassos. When Empress Theodora put an end to the prohibition against icons in 842, Cappadoca once again resumed its active religious life. However, the issue of the monastic clergy collecting alms became a subject of conflict with the imperial government and a longstanding problem that led to a struggle between the two institutions.Already by the tenth century and even in the time of Nikephoros Phokas, this dispute had turned bitter.As reasons for the restricting the sphere of donations and bequests as well as that for which they were able to collect taxes on their vast land and property holdings, the emperors claimed that their own treasuries suffered loss because of this and their armies lacked men and were incomplete.Hence, the imperial administration had begun to search for ways to exert limitations on the monastery property holdings.E.Barker portrays the situation in the light of a contemporary record, as follows: “It is decreed that donations may be made to monasteries, guest lodges and soup kitchens that had been founded from of old, but this assistance is not to be in the form of land or farmlands or in the form of a new structure; that which has been done up to now is sufficient.The pious foundation that have been in existence for some time must be prudent; for example, they must make repairs by selling the farms in their possession by selling to people outside the churche, by using the loans to buy cattle and sheep and setting up stables and pens .The erection of new monasteries or hostels or soup kitchens is prohibited. For this reason, henceforth (that is, from 964, the year the novella was issued) it is not permissible for anyone to transfer deed of title of land, farms or houses to monasteries, soup kitchens or hostels or a metropolis or bishopric. Such transfers will in any case remain null. But in the case that any existing religious facility or any monastery or metropolis or bishopric has no farm remaining in its hands because it is administered poorly or controlled, our decree and approval (for necessities) will grant permission for the acquisition of property. As for the founding of convents and lauras-they were not to be joined to other property and enlarged; on condition that such foundations remain within their own boundaries, those who wish set up such structures rather than hindrances we will regard these as a good deed worthy of praise”.Nonetheless, because the church had acquired significant economic power and sharpening the dilemma of the poor feudal Byzantine villagers, a civil war that was to break out in the future.Like the predecessors of ancient Greece, they (zelotis) also defended the position of social equality; though their forerunners had wanted the abolition of debts by a more inclusive program and a reallocation of land (khreon apokope kai ges anadosmos), the zelotis at least went as far as aiding the poor and demanding that ıırban monasteries be made propertyless and that the wealth of the rich should be seized with the aim of making general reforms. The elite once and whatever remained from the Byzantine empire became a factor in such a monastery type being a dominant orthodoxy and defined its concept. But, Cappadocia, which early came under the rule of the Seljuks and Ottomans and the economic practices of the Seljuks and Ottomans, this development failed to occur in the churches here.Numerous churches were in existence and the variety of their wall paintings and frescoes were notable at Zelve, Çavuşin, Ürgüp, Göreme, Avanos, the Belisirma valley, Avcılar, Uçhisar and Ortahisar. No precise dating of all these monuments has been made and especially regarding the decoration made prior to and during the period of iconoclasm no sound consensus has been reached. In addition, the interior construction of the buildings demonstrates that those in Cappadocia were fully current on all the plans utilized by Byzantine architects (moreover, here the structures were being carved out of rock). One or several basilicas with naves, all elements (domes, pillars, columns, vaults, niches) used in neighboring regions (Mesopotamia, Syria, Lyconia, Pamphilia) are encountered in cruciform plan churches. In fact, there are examplessuch as the Soğanlı church-where after the rock mass had been carved out, the exterior was worked in the form of a domed church. 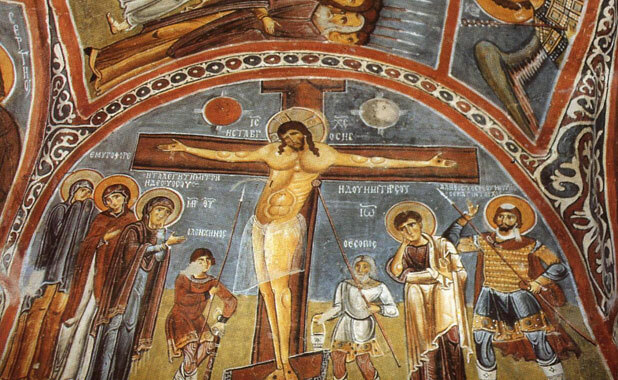 In paintings of the early period (sixth-seventh centuries), scenes depicting the life of Jesus or the saints (the paintings of St. Basileios and St. Gregorios in the Church of St. John at Çavuşin) were combined with the classic motifs of the primitive painting (the trees of Eden, vineyards and fish hung on crosses). It is necessary to keep in mind that the strengthening and waning of beliefs or the strengthening and waning of religious and artistic knowl- edge developed in tandem with the naturalistic depictions of animals and vegetal and floral decorations drawn and painted in a crude fashion.Hence, the primitive archaic designs generally occur in the oldest churches-in those where religious thought had not yet cohered and become adopted fully and in a detailed manner the grouping is an indicator of this.Niketas and Sylite (Ortahisar 550-80), Sarica church, Kepez (southeast of Ortahisar 950-1020), Canbazlı church (Ortahisar 1020-1130), Saklı church (near Ortahisar tenth-eleventh centuries) are prominent examples. Some churches can be dated accurately. These churches offer the possibility of determining a certain date, either because it is attributed to a certain historical event or a historical phenomenon is pictured in its name or the name of the builder of the church is inscribed.On this basis, it has been established that five churches are from the tenth century, four churches are from the eleventh century and three churches are from the thirteenth cen- tury. Thus, the Tavşanlı church (in the vicinity of Ortahisar), St. John Güllü Dere (near Çavuşin) and the new Tokalı church of Constantine VII were built prior to the years 950-60. Churches have been dated with those originating from the eleventh century inculde Direkli church (976-1025), St. Michael (1055-56), St. Barbe at Ihlara (1006-21), Karabaş church at Hasan Dağı (1060) and the churches at Soğanlı from the thirteenth century, Karşı church (1212), Forty Martyrs church at Suveş (1216-17) and St. George church at Belisirma (1283-95). Such carving and decoration activity executed by the Christian communities continued for approximately nine hundred years (from the fourth to the thirteenth centuries). Neither the Arab invasions (between the seventh and ninth centuries) nor the iconoclastic period, which was the most troublesome for Christianity (sixth to nirıth centuries), nor even the years between the ninth and the twelfth centuries, when Turkish tribes were mounting assaults and in the era when the Seljuks had established their hegemony, interrupted the practice of carving and painting, The religious tolerance of again gained control of their power in the city of Thessaloniki the Ottomans and their policy of no direct interference with religion of the villagers achieved positive results and led to the earning of the favor of most of the villagers. A great many monastery complexes, rock churches and new rock spatial interiors were also made during this period.For example, an inscription on the Kırkdamaltı church situated near Belisima village in the Ihlara valley bears the names of both the Seljuk sultan Mesut II and the Byzantine emperor Andronikos II. This inscription tablet, dated 1283-95, is interesting from the perspective of showing contemporary attitudes and practice, which are based on tolerance and respect.